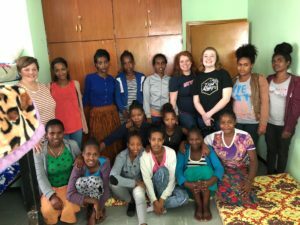 I have so many thoughts racing in my head about our trip to Ethiopia and the Keziah House and wanted them to settle down a little before I wrote anything on paper. Problem is, my thoughts never settled down. They’ve become a mess of questions and elation and surrender and fight and anger and rejoicing and celebration and mourning. Faces in Ethiopia are blurring with faces here. The global church competes in my head with our local body of believers. 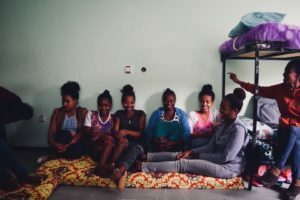 Ethiopia so quickly can become a beautiful picture, a moment in time, a bulletin board, a far off prayer request. What is right near the surface now, so quickly fades. Even if we didn’t say it out loud, I think it’s safe to say we all wanted to come home to our little towns with some sort of answer; some Divine, Road to Damascus blinding light moment to make us truly see…SOMETHING. A reason…an answer on some level as to why. Why are we here? Why them and not us? Are we supposed to DO something? How in the Name of all that is good and holy, does what is happening there happen at all? The depravity of what humanity does to each other astounds me. And how, in that same Name, does what is happening there translate to what is happening at home? How do we bring this experience home or should we? Will what is done there or here be measured…at some level…by those expecting results or more or bigger or better? I still have more questions than answers. But I know a couple of things. I know the answer to whatever question is always and in every way JESUS even when we don’t see, understand or feel like it. Jesus remains the same. His message, the Good News of the Gospel, the Truth, by faith, has to be the same. Lifting Him higher. Drawing others to Him. But how can that possibly be true? I am here, in America; a married, mother of 7 (8 with my son-in-law), living in the suburbs, with piles of laundry from the clothes I mostly don’t have to worry about providing for my kids and dirty dishes in my sink from the meal that I really didn’t have to think that much about, in a home that needs work but shelters, invites and is secure and with my husband providing all that our family needs financially. These women are there, opposite in almost every single way that there can be. Surviving. Making choices. Choices made for them, against them. Life is different. Provision is different. “Success” is different. Some things, though, are the same. Darkness is the same. Despair is the same. Shame is the same. Lost is the same. The rescue mission may be different, but our Rescuer is the SAME! And, same as with all of us, there is always a learning curve when coming into the Light. While we were there, we had the blessed honor of being invited to the girls’ rooms. This is where some real learning takes place. Learning about life skills and relational skills…cause guess what?…its hard to have that many women in a home, learning a new life, and allowing others to learn their new lives…learning forgiveness and how to bear one another’s burdens, learning how to find their voice, when they may never have had one before. Learning the power of that, the responsibility of that. Learning their worth, their beauty and what it means to have a God who delights in them and even sings over them! Isn’t that the same for us, those of us brought in from the darkness, into the Light of Christ?…Learning curve! This trip was, for me, an all-too-brief, reconciling moment of the truth of God’s Kingdom come; a vision of the ransomed, rescued and redeemed. True Gospel. We pray for the starving in Africa, but it is us that is starving for the desperation of THAT: True Gospel. This trip was also a beautiful vision of the strength, provision and gifts of shepherding from God’s kingdom workers: Yonas, Yared, Markos, Aklilu, Efrata, Tinsaye and Sidese…and those we didn’t get a chance to meet. This team is such an amazing example of “knowing the condition of your flocks.” They care for, teach, pour into, keep track of and welcome into community each current student and each graduate from Keziah. I was humbled by their devotion and their hearts. They blessed US…not the other way around. And sadly and joyfully at the same time, this trip confirmed that lost is the worst form of darkness and its really ok to let that rip you apart. It should. And its ok to be ripped apart at the same time as experiencing the pure light explosion of celebrating the true joy of the lost being found, because shouldn’t we join with all heaven and the angels as they do that? What does this trip mean? What can we do for these beautiful young women in Keziah House? We can send our money – because lets be honest…even those of us with little here…it can go a lot further there. We get that joy of giving. They get provision and knowing that believers across the world walk with them how we can. And We can pray. Really pray. Because God gave us the power and the honor to be intercessors. We can let out hearts break. We can let out hearts celebrate. We can mourn the loss of those that haven’t been found yet. We can trust that God is sovereign and not one single soul is outside of His eyes that see all that there is, was and is yet to be.